The fact that we have over an hour of watchable video from Widener College, February 6, 1975 is nothing short of miraculous. Need I remind you that Widener represents the ONLY extant footage of E Street Band featuring Suki Lahav. It is the ONLY extant footage of “Wings for Wheels,” the early version of what would become “Thunder Road.” It offers a precious glimpse of Bruce and the band BEFORE Born to Run was even fully recorded. And apart from the bonus footage of Ahmanson Theatre 1973 on the Born To Run 30th Anniversary DVD, Widener is the earliest E Street Band footage of complete songs, PERIOD. The story of how Widener was videotaped has been misreported for decades, but recently the Widener College Alumni magazine uncovered the true story. It was not shot by two students involved in a filmmaking course. It was in fact shot by Michael Turner and Jeff Audet, two huge Bruce fans who, on what can only be described as a lark, borrowed a Sony Portapak video recorder (see image link below) that belonged to Jeff’s father and decided to attempt to film the show. For years, the pair would pull out the video tape to show at parties and sometime around 1986, a copy they gave to a Philadelphia DJ began to circulate widely among fans on VHS. 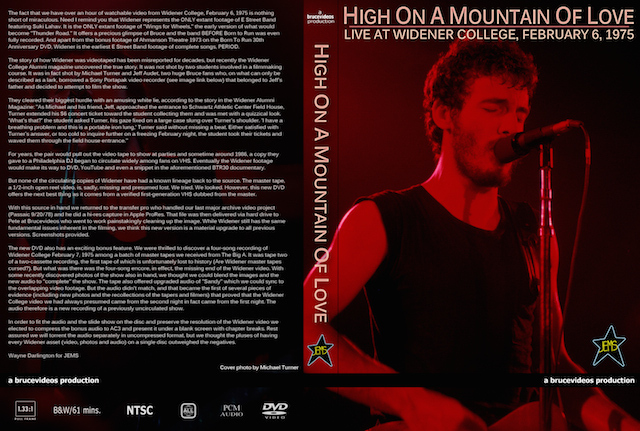 Eventually the Widener footage would make its way to DVD, YouTube and even a snippet in the aforementioned BTR30 documentary. But none of the circulating copies of Widener have had a known lineage back to the source. The master tape, a 1/2-inch open reel video, is, sadly, missing and presumed lost. We tried. We looked. However, this new DVD offers the next best thing as it comes from a verified first-generation VHS dubbed from the master. With this source in hand we returned to the transfer pro who handled our last major archive video project (Passaic 9/20/78) and he did a hi-res capture in Apple ProRes. That file was then delivered via hard drive to Pete at Brucevideos who went to work painstakingly cleaning up the image. While Widener still has the same fundamental issues inherent in the filming, we think this new version is a material upgrade to all previous versions. Screenshots provided. The new DVD also has an exciting bonus feature. We were thrilled to discover a four-song recording of Widener College February 7, 1975 among a batch of master tapes we received from The Big A. It was tape two of a two-cassette recording, the first tape of which is unfortunately lost to history (Are Widener master tapes cursed?). But what was there was the four-song encore, in effect, the missing end of the Widener video. With some recently discovered photos of the show also in hand, we thought we could blend the images and the new audio to “complete” the show. The tape also offered upgraded audio of “Sandy” which we could sync to the overlapping video footage. But the audio didn’t match, and that became the first of several pieces of evidence (including new photos and the recollections of the tapers and filmers) that proved that the Widener College video we had always presumed came from the second night in fact came from the first night. The audio therefore is a new recording of a previously uncirculated show. In order to fit the audio and the slide show on the disc and preserve the resolution of the Widener video we elected to compress the bonus audio to AC3 and present it under a blank screen with chapter breaks. Rest assured we will torrent the audio separately in uncompressed format, but we thought the pluses of having every Widener asset (video, photos and audio) on a single disc outweighed the negatives. This entry was posted in 1975, bootleg, scaletta, springsteen, video and tagged 1975, bootleg, springsteen, video by Tsitalia. Bookmark the permalink.